This is the fifth short article in my series about ways kids can create picture puzzles. The first was Creating Picture Puzzles - Spot the Difference, the second was Creating Picture Puzzles - a Digital Image to Copy, the third was Creating Picture Puzzles - Seek and Find. and the fourth was Creating Picture Puzzles - Counting Puzzles for Younger Children. Creating a rebus story digitally is a little like inventing something according to set parameters. It’s not the kind of story where you can allow your imagination free rein. Instead, children need to look at the images available and weave a story around them. If they start by writing the story first, it can be quite difficult to find a small image to stand in for a word or lots of words. 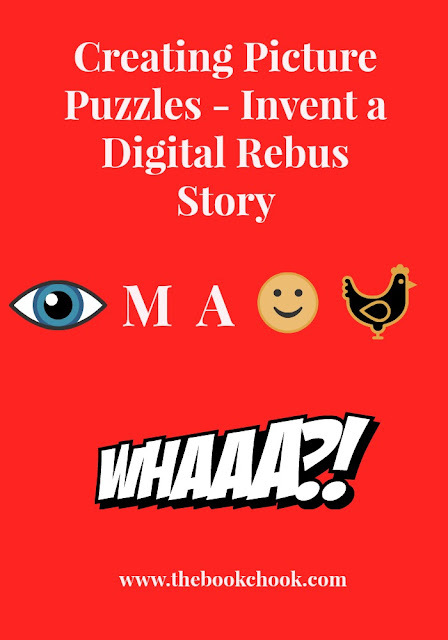 Today I want to explain a way children can create their own digital Rebus Story. 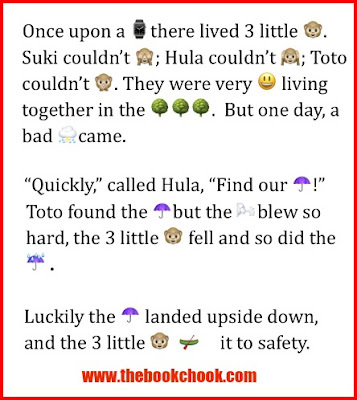 To follow this method, children will need to have emojis enabled on their keyboards, or copy/paste them from a website like Emojipedia. Open a new document in the word processing program you want to use. For me, on a Mac, this means using Pages or Text Edit. Go to the top of your browser screen and you will see Edit/Emojis and Symbols. Browse through them so you get an idea of what’s available. Then type out your story - with no emojis the first time. Duplicate that text. In the second lot of text, insert emojis where you want. This method is to avoid the formatting glitches that will occur when you combine text and emojis as you type. 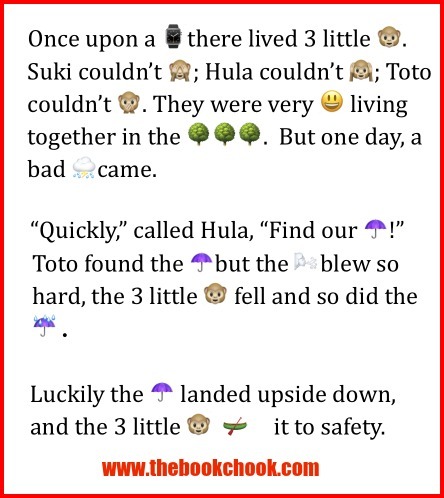 And if something goes wrong, kids still have the first story to use and can try again. Once I was finished, I exported (File/Export) to PDF, then exported the PDF as an image (File/Export, then change Format to JPEG or PNG.). Below is a slightly more complex example. Some kids will love the challenge of creating a story despite the limitations; others will just love being able to combine images and text. Of course, kids can use little images that they draw and scan, or use clipart - or not make something digital at all - a rebus story is fun to do with pencil and paper too. 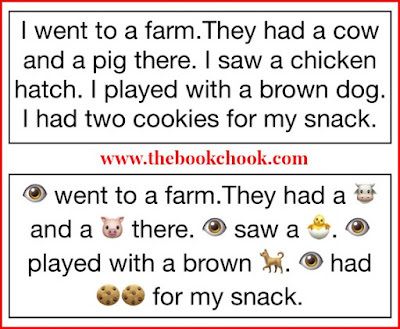 But one way to combine technology with a rebus story activity is to introduce kids to the emojis and symbols available on their own computers and online. Interested in making puzzles with kids? Check out these free PDF/doc templates I found to download with different numbers of pieces you can use for printed digital photos children take. 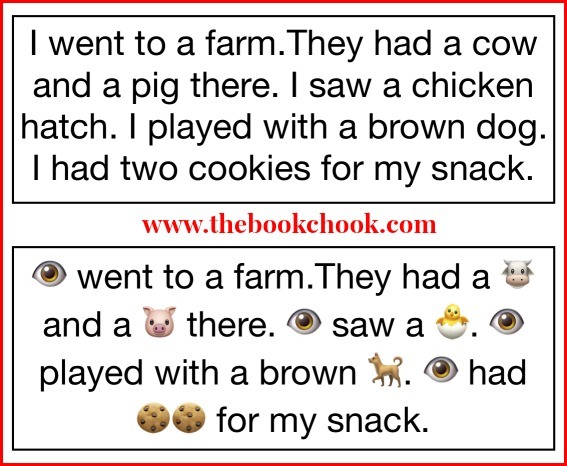 You might also be interested in my own Word and Image Puzzles for Kids, Literacy-Based and Other Guessing Games, Creating Images with Students, and Creative Prompt for Kids - Start with an Emoji.